Discover what others already have - how to de-stress for good! 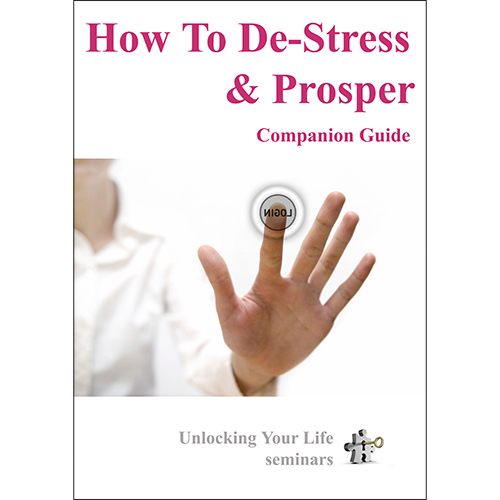 Discover what others already have - how to de-stress for good! Everybody suffers stress. It's normal. What's not normal is to suffer stress every moment of the day for years and years. Yet this is a state in which many people find themselves, and its impact is devastating physically, mentally and financially. Clarify once and for all the mess that stress is. Challenge the belief that stress is something you just have to 'put up' with. Show you how to lower your stress levels and keep them low. Develop habits to improve your prosperity. Help unlock the true potential of your life. Since 2000, Unlocking Your Life seminars has been helping people of all ages achieve their personal-development and emotional-management goals through the practice and philosophy of empowered living - the specific knowledge of achievement, success and fulfillment. Our intent is to help uplift you to the abundance and fullness that life has to offer. "The main reason people struggle emotionally is because they have not been taught how to let go, which traps them in a continual cycle of stress and suffering. If only they realised the role they play in keeping themselves to live the life of prosperity they were meant to live."